How Can I Get Rid of This Wart? Plantar warts are a common complaint seen in our office. They are most likely seen on the soles or toes and are often painful and difficult to remove. 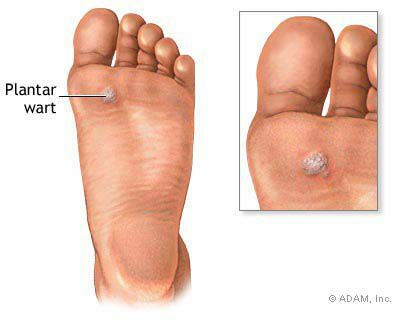 Plantar warts are caused by the human papilloma virus (HPV), which affects the cells in the outermost layer of skin. Showers and swimming pools are thought to be high risk areas because they harbor the virus in the moist environment. Plantar warts typically present as a small bump, and may resemble a callus. However, unlike a callus, warts have their own blood supply, which can be seen as tiny black dots within the wart. They can be painful when walking, or when placing direct pressure over the wart. Pain is also present when squeezing the sides of the wart together. Treatment for warts can be tricky as they are associated with high recurrence rates. Some may resolve without treatment and some may be resistant to treatment and may require aggressive therapy. Treatment is recommended for patients with warts that are enlarging, spreading, associated with pain or have been present for many years. Salicylic acid is the first therapy used to treat warts. This is prescribed by your doctor. Salicylic acid has good success rates, but the treatment time can be long, sometimes lasting many months. If salicylic acid is unsuccessful, other topical agents or more aggressive therapy should be considered. Cryotherapy is another common treatment for plantar warts. This is considered to be more aggressive as it uses liquid nitrogen to freeze the wart. This is done in the doctor’s office. This method creates a blister between the wart and the underlying skin. Eventually as healthy skin heals the wart and surrounding dead skin fall off. Cryotherapy typically requires multiple treatments for complete resolution of the wart. If cryotherapy is unsuccessful, surgical excision may be considered. This should be the last resort, as there are associated risks of scarring and recurrence. Plantar warts are a common ailment of the foot. They can be associated with pain and may be difficult to treat. It is important to take preventative steps to ensure that you or others around you do not develop plantar warts. It is important to wear shoes at all times, especially in communal showers and on the decks of swimming pools. If you have a wart, make sure it is covered if you are going swimming or are walking barefoot. Do not share socks or shoes, and avoid direct contact with warts on other parts of the body or on other people. If you or someone you know is struggling with plantar warts, schedule an appointment with your podiatrist to discuss treatment options!